Skein is approx 180 yards. 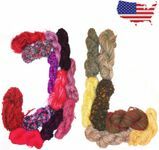 Light Worsted W. Multicolored cotton hand dyed yarn direct from India, this yarn is a truly recycled product! It is a Light Worsted weight and is soft and easy to knit or crochet. Suitable for: Scarves, neck warmers, cowls, shawls, stoles, bags, pouches, cushions, embellishment.